Taiwan has lost yet another member of the small group of countries that recognize it diplomatically with Panama in Central America making the move to build ties with the PRC instead. The last country to switch ties was São Tomé and Príncipe in December 2016. Before that it was Gambia at the beginning of the previous year. But in between it must also be recalled that there was the move in Nigeria to get the Taiwan representation to move from Abuja, the capital, to Lagos, Nigeria’s commercial center, an attempt to curtail whatever limited diplomatic privileges that the Taiwanese enjoyed in practice there. Taiwan is now down to just 20 countries recognizing it officially. Over the past few months, there has been a lot of chatter in virtual corridors that Africanists inhabit, trying to assess what the new presidency in the US means for the continent. 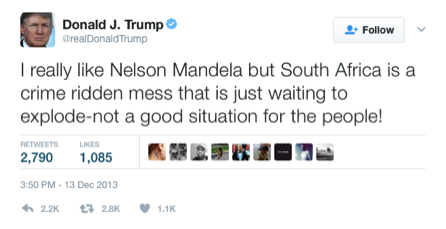 Donald Trump’s repeated references to the region during the campaign had not struck the right chords with African scholars and leadership alike. Taiwanese President Tsai Ing-wen called up US President-elect Donald Trump on 3 December to congratulate him on his victory. A statement from the Taiwan Presidential Office stated that the call lasted just over 10 minutes and that Tsai and Trump ‘shared views and ideals on governance, especially on promoting domestic economic development and strengthening national defense’ and ‘also exchanged views briefly on the situation in Asia’. Tsai ‘expressed the wish of strengthening [Taiwan-US] bilateral exchanges and contacts and establishing closer cooperation relations. Jabin T. Jacob, Assistant Director and Fellow, Institute of Chinese Studies. Taiwanese President Ma Ying-jeou’s visit to Taiping/Itu Aba Island in the Spratly Islands on 28 January 2016 was justified among other things on the grounds that he visited men and women in uniform before every Lunar New Year and that he was seeking to clarify the legal status of the island. Bhim Subba, ICS-HYI Doctoral Fellow. More than 18 million registered voters among 23 million people, above the age of 20 will exercise their suffrage for Saturday, January 16 in Taiwan. As expected, the mood in the island is with the Pan-Green Democratic Progressive Party (DPP) coalition under Tsai Ing-wen. The Pan-Blue Kuomintang (KMT) under Eric Chu, who replaced Ms. Hung Tsui-Chu (Deputy House Speaker), breaking the convention, is most likely to face drubbing and James Soong, former KMT heavyweight, heading the People’s First Party (PFP) rallying at the last.